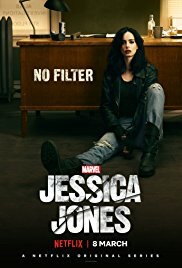 Plot: Jessica Jones is a raven-haired superhero slowly drinking herself into an early grave, a habit she supports by taking sleazy PI jobs. In the first series she confronts mind-controlling villain. In the second, she mostly confronts her own demons. Pros: Dark and bloody and bitter – the way we like it.